Want to be the strongest guy in Bedrock? You will be when you wear this Bamm Bamm costume. 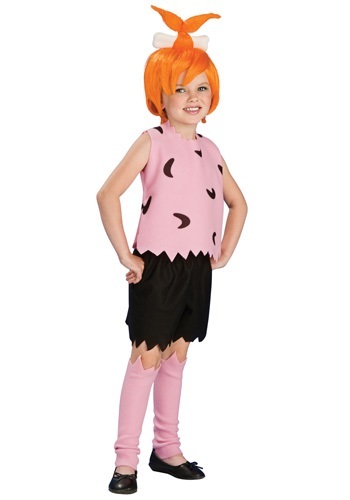 This is a great costume to wear as a part of Flintstones group of costumes or just as cute couples look with Pebbles. But be sure to pick up one of our clubs, because we all know Bamm Bamm never leaves home without his. Want to look like the most adorable girl in all of Bedrock? You will when you wear this cute dress and wig. 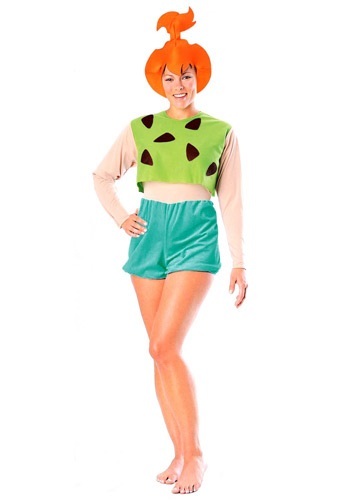 This is the perfect costume to wear as a part of a couples look with our Bamm Bamm costume or as a part of a large group going as the whole Flintstones family. Become a strong man of legendary proportions in this Bamm Bamm adult costume. The funny cartoon costume is perfect for any fans of the old cartoon, and makes a great choice for Halloween. Get some friends together and make it a group theme with many different Flintstones costumes to choose from! If there is one thing that Bamm Bamm does great it's smash! This caveman has been swinging a club around since he was a newborn. Now that he's all grown up he still is the strongest guy in all of Bedrock. But even though his chest is a tough as a rock his heart is as soft as mammoth fur for his sweetie Pebbles. 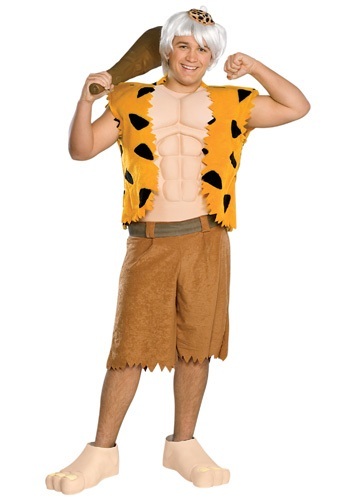 Now you can become the buffest guy in all of the stone age in this Flintstones costume. Bamm! BAMM BAMM!Who is the strongest of all kids in the town of Bedrock? Bamm Bamm is. Betty and Barney Rubble's little one loves to take his trusty wooded club and smash what ever he can with it. 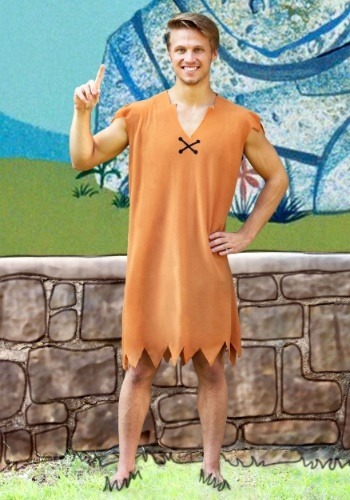 Now your tiny tot can look just like the fittest caveboy ever in this offical Flintstones costume. Being a best friend is hard work, especially in the time when dinosaurs roamed the earth. In order to go on a drive with your good buddy you would have to get in your car and use your feet to propel it along. That is exactly what Barney Rubble would have to do when ever his neighbor Fred would want to go somewhere. But Barney never complained, he was just happy to have some time with buddy. 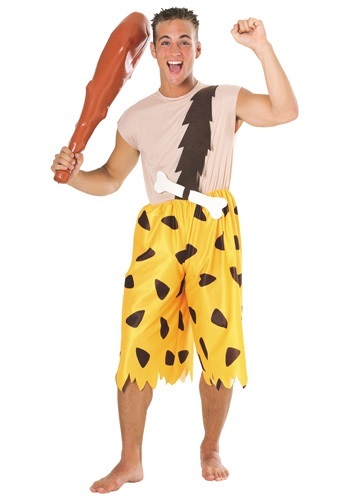 Now you can look like the loveable caveman next door in this costume straight from The Flintstones. Get a costume that's "on the rocks" this year for Halloween. Our Betty Rubble Adult Costume is a great choice for anyone who's a fan of the modern stone-age family. 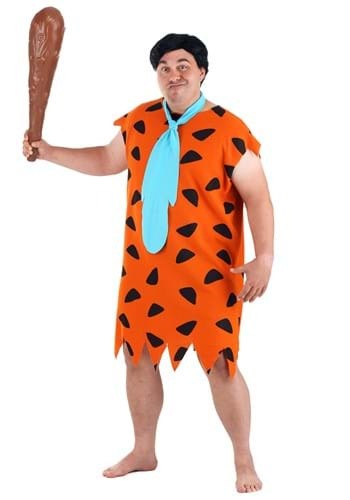 And with plenty of other Flintstone costumes to choose from, you can invite the whole gang and make it a theme party at your next get-together. Yabba dabba doo! The stone age was a different time. People used various dinosaurs and animals as household appliances and you had to drive a car with your feet. But what was still the same is that you just needed love to make a marriage work and that is what Betty and Barney Rubble prove. These two never were a rich couple but that didn't matter because they were wealthy in the amount that they cared about each other. Now you can become one half of an adorable couple in this Flintstones costume. It's a well known fact that cavemen had amazing hair. It seems counter-intuitive to what we know about them, but since they had so little to do all day (there was no Twitter after all), they just combed their hair with a bone comb all day while grunting about how much their pet dinosaur smells. You don't have that kind of time! We got things to do and can't just sit around a fire all day combing our hair... that's why this cartoon caveman wig is so important. Get the look without the stone age lifestyle! Cavewomen had great hairstyles. We're not sure why that is, but they really had a great sense of fashion in all they did, from the jagged hem tunics to the stone pearls to the hairdos. Our Deluxe Cartoon Cavewoman Wig is going to give you an incredible look without having to spend hours in that stone age hair dryer dome that is powered by small dinosaurs running on a wheel. Hey, that was considered high tech back then! It's not easy being a caveman, especially when you want to be stylish, fashionable, and want to stand out. Not everyone can become so lucky, especially in the stone age where being sat on by a mammoth is basically a daily hazard of living. That's why our Deluxe Caveman Neighbor Wig can give you all the look without the primitive dangers. We can't say that a woolly mammoth won't come out of nowhere and mess up your hair, but since they've been extinct for hundreds of thousands of years we kind of doubt it! You know how those stone age villages were... so full of gossip! Who has the best garbage disposal warthog, who has the most clams, who's husbands feet are bigger and can brake the car the best. 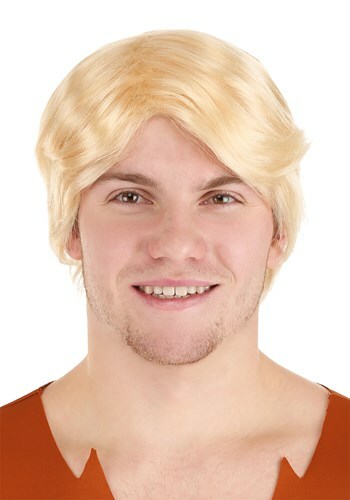 This Deluxe Cavewoman Neighbor Wig will give you the latest fashion statement! It's a beautiful look that is going to have all the other cavewomen talking. He'll jump on you, knock you down and slobber all over your face the second you come home to your cave, but that's what you get yourself into when you have a snorkasaurus for a pet. Your only other option for a pet is a hopparoo, and those things have a mean kick you have to watch out for. Who was the coolest guy back before the ice age? Why that would be none other than Mr. Fred Flintstone. This hip prehistoric guy was known as the best bowler Bedrock has ever seen. The tricks he could do before he'd get his strike would amaze all that watched. He could dance on his toes before he tossed the ball and then after he let go of said ball it would zoom down the lane knocking each pin on it's side. Now you can dress just like Fred in this great fashion statement from the time of dinosaurs in this great costume. Your little girl will have a blast pretending to be back in the stone age when she wears this adorable Wilma Flintstone costume. She can pretend to do chores around the house with the help of some cute dinosaurs. 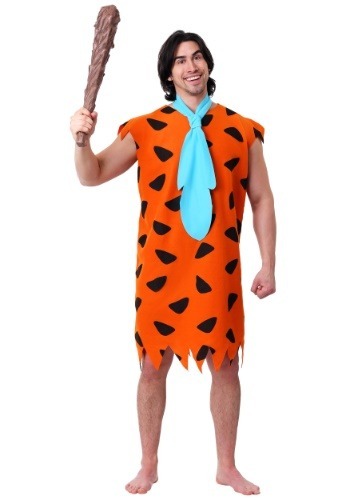 This costume also works great if the whole family is doing a Flintstones theme this Halloween. "Yabba dabba doo! 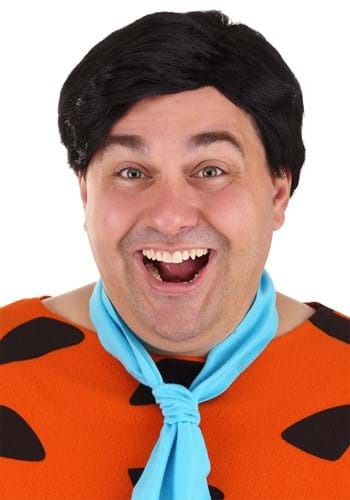 "If you were to ask anyone in the town of Bedrock who the coolest caveman that lives there and you'll be told one name time and time again, Fred Flintstone. This one man has gone on many adventures with his best buddy Barney Rubble that has spanned from a sports car race to trying to con Rock Vegas. Now you can become the classic cartoon character in this fun costume. 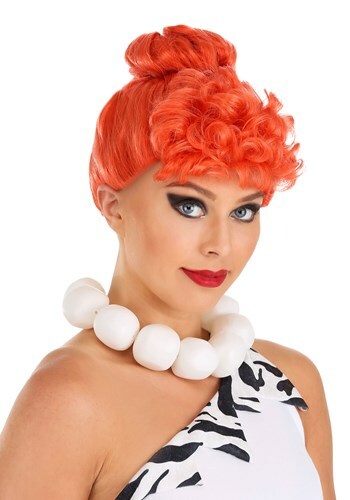 This Pebbles Flintstone costume is sure to get some cheerful comments from your friends! It has Pebbles’ classic green crop top with a rock pattern, and of course her blue shorts. The whole suit ties by the back of the neck and the orange head-piece fits perfectly on the head with elastic. This costume and our Bamm Bamm costume are perfect for couples! Being the daughter of the most well known man in Bedrock can be a lot for a kid to deal with but Pebbles doesn't let it go to her head. She has keep down to earth and never asked for the latest and greatest in things she doesn't need like a record playing bird. But she also has had the greatest friend in the world to help keep her level, Bamm Bamm. 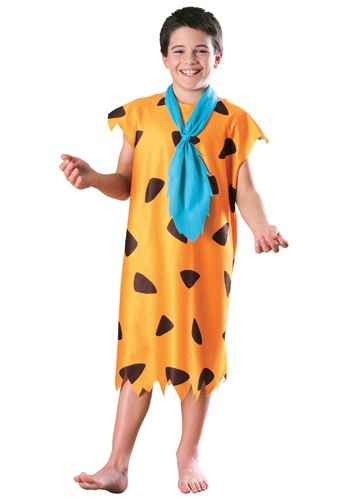 Now you can look like the hippest teen in all of Bedrock in this adorable prehistoric costume. Chances are you'll love being Wilma if:* You're part of a modern stone age family* You're married to a big oaf who loves Brontosaurus ribs and bowling* You love making rock puns all day* You can handle your friend's super strength toddlerHave a yabba yabba doo time this year with this Wilma Flintstone Costume! Being the wife of Fred Flintstone is hard work. You have not only have to do the up keep on the house but you also have to deal with the outcomes of his constant shenanigans. But luckily for Fred his wife is Wilma, who can deal with any situation thrown at her. She has had to deal with Fred's crazy financial plans and also his tendency to go into dangerous plans. 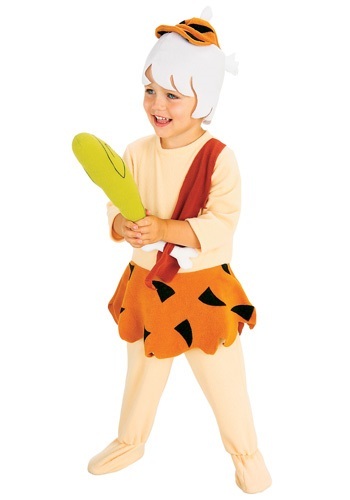 Now you can look like the finest lady in all of Bedrock in this Wilma costume.